More than two decades after the end of a devastating civil war, Mozambique is now officially free of landmines. I report on how local residents, backed by Mozambican and foreign NGOs, did the job. 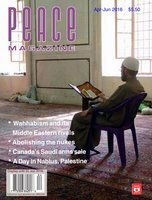 Check out the full article in the April-June, 2016 issue of Peace magazine.